Selenium (Se) is now recognised as an essential trace element for ruminants. It is required in cattle for normal growth and fertility and for helping to prevent other health disorders such as mastitis and calf scours. However, if given in too large a dose or more than one supplement containing selenium is given at the same time, it can be toxic. 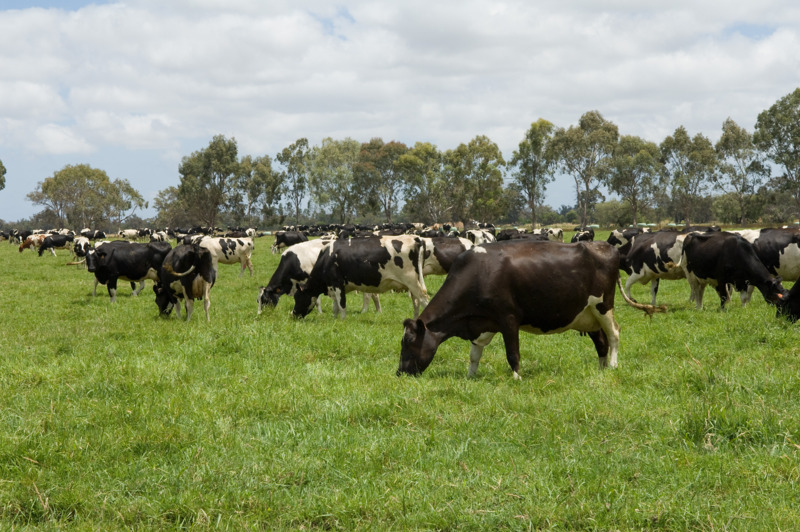 Why is selenium important in cattle diets? Selenium forms part of a number of enzymes and other proteins in animal tissues. In particular it is a component of the enzyme glutathione peroxidase (GSH-PX). This enzyme inhibits and destroys naturally occurring peroxides that cause cell damage. It acts in conjunction with vitamin E to protect cell membranes including cell walls. This protection is particularly important in muscle cells that work hard and consume large quantities of energy and oxygen. Selenium is found in the soil and taken up by plants at different levels depending on plant species, fertiliser application and rainfall. Cattle consume selenium with the plants they eat. It is stored for a short period in the body, mainly in the liver, so a continual dietary supply of selenium ensures the best possible production. What are the signs of selenium deficiency? When there is a deficiency of selenium, harmful free radicals are generated. These damage muscle tissues of the heart and limbs (skeletal muscles). This disorder is called nutritional muscular dystrophy (NMD) or white muscle disease. Selenium is also very important in maintaining a healthy immune system so deficient cattle may be more susceptible to some common infectious diseases. premature, weak calves, perinatal death and abortions. weakness and unable to stand or walk. Selenium deficiency most commonly occurs in young calves and calving cows, but is also seen in adult cattle. Where is selenium deficiency most common in Western Australia? paddocks that have received heavy or long-term sulphur-containing or superphosphate fertiliser applications. In WA, selenium deficiency is seen mainly in the higher rainfall areas of the south-west, particularly along the coast. Early diagnosis of disease and treatment are essential to minimise production and stock losses. A veterinarian can help diagnose selenium deficiency by collecting blood or post-mortem samples for laboratory analysis. They can also provide help on the most appropriate selenium supplementation program for your herd and property. How is selenium deficiency diagnosed? A combination of clinical signs suggestive of selenium deficiency, geographical area and laboratory samples can help with a diagnosis of selenium deficiency. Recent selenium status of cattle can be assessed by testing blood samples from some of the herd or liver samples from an affected animal. These are the most accurate ways to assess selenium status. Soil samples are not suitable for determining risk of selenium deficiency in animals as the total soil selenium level includes elemental selenium and selenite, both of which are relatively unavailable to pasture plants and selenium uptake by plants is inconsistent. Stock have a higher requirement for selenium for health than plants so plant tissue testing is not very useful. Assessing selenium levels in total mixed rations for dairy cattle may be done as part of a herd health program.